Tottenham will host Burnley in a Premier League game tomorrow at White Hart Lane. Tottenham striker Emmanuel Adebayor is set to miss this game too as he is not match fit. The former Arsenal striker was on a leave in the recent weeks due to his personal issues. Summer signing Eric Dier is doubt for this game despite of playing a Capital One Cup game against Newcastle United in the midweek. Meanwhile for away side, Matthew Taylor, Sam Vokes, Stephen Ward all are out with their injury problems but Michael Duff and Ben Mee could take a part in this game. Ben Mee suffered an injury against Southampton last weekend. In the last six meeting between these sides, both of them have won three. The draw between them last time was in 1993-1994 season. Spurs have lost only a game from their last five Premier League games. Burnley have also lost a game from their last five League games. Last time at White Hart Lane, Tottenham scored five goals against Burnley. The away side have not scored in five of their last seven League games. 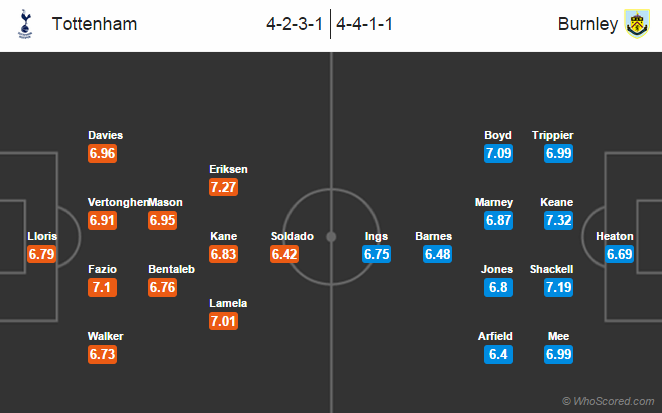 Tottenham 2 – 1 Burnley, the away side will be having high confidence as they are coming from a win over Southampton.